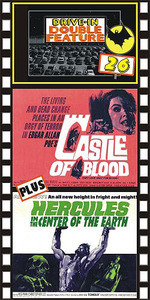 CASTLE OF BLOOD (1964) Barbara Steele, George Riviere, Margaret Robsahn, directed by Antonio Margheriti. An excellent horror film about a writer who accepts a bet that he'll be alive in the morning after spending the night in a sinister castle. The castle is filled with the ghosts of miserable souls who died horribly in real life. Top notch thrills as Barbara portrays a tortured member of the living dead. Barbara’s best film? One of the best Euro-horror films ever made. From 35mm. Plus: HERCULES IN THE CENTER OF THE EARTH (1961, aka HERCULES IN THE HAUNTED WORLD) Reg Park, Christopher Lee, George Ardisson, Leonora Ruffo, directed by Mario Bava. A classic fantasy. Hercules searches Hades for a magic stone that will cure an ailing princess. The film’s climax has Park pitted against several horrifying monstrosities. A sword, sandal, and fantasy must! Great color, widescreen, from 35mm.